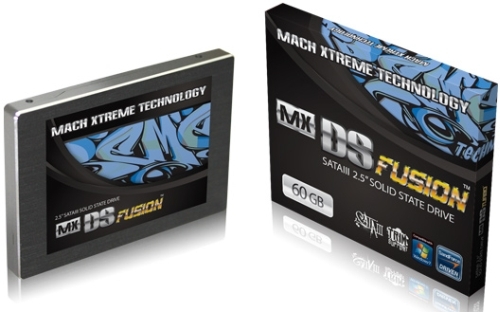 Taipei, Taiwan—July 14, 2011 – Mach Xtreme Technology Inc., a worldwide leader in top performance, high reliability and user friendly designed PC components, today announced the 2.5” SATAIII MX-DS FUSION Series SSD for budget conscious enthusiasts. MX Technology releases the DS FUSION series adding up to its SATAIII line-up after the DS TURBO series. This series comes at a price point that is friendly to budget-conscious users. Advanced high speed SATAIII interface has been implemented in newer systems to remove previous performance bottleneck. The MX-DS FUSION Series is perfect to take advantage of that higher speed interface offering unparalleled level of performance. This series delivers performance that maximizes the throughput of a SATA III 6Gb/s interface with balanced read/write speeds. It supports DuraClass™ and DuraWrite™ technologies. DuraClass™ technology provides best-in-class endurance, performance and low power consumption. DuraWrite™ technology optimizes writes to the flash memory over conventional controllers increasing the overall endurance and reliability of the complete SSD. Highly intelligent block management and wear leveling also extends the overall endurance. It maintains backwards compatibility with existing SATA II 3.0 Gb/s and SATA I 1.5 Gb/s interfaces. The MX-MD FUSION drive delivers best-in-class read and write speeds clocking in at up to 540MB/s read and 510MB/s write along with the maximum of 80,000 IOPS, low power consumption (stand-by 1.6W / active up to 2.8W) and superior durability (2.0 million MTBF) compared to previous generation SATA 3Gb/s drives. The Mach Xtreme DS FUSION series comes in 60GB and 120GB versions backed with 2 Year Warranty and outstanding after-sales service.